Description: This is a vast and beautiful temple heralded as Ratnasabhai - one of the five Pancha Sabhais special to Nataraja featuring a sprawling well maintained temple complex with beautiful mandapams and gopurams. It is located within two hours drive from Chennai, and within an hours drive from Kanchipuram. The five dance halls are Chidambaram, Madurai, Tiruvalankadu, Tirunelveli and Kutralam. This is the 15th of the 32 Tevara Stalams in the Tondai region of South India. Legends: Shiva is said to have defeated Kali in a fierce dance duel by lifting his foot up on the Oordhvatandavam posture. Kali is depicted in a dance posture as well here. Karaikkal Ammayar is said to have walked on hear head to this shrine and her image is seen in the shriine to Oordhvatandavamurthy. There is yet another image of Nataraja, housed within the sanctum of Vadaranyeswarar. Legend has it that upon being requested by Naradar, to save the earthly beings from the rage of Kali, born out of her vanquishing the demons Sumban and Nisumban in the banyan forest in this region,Shiva agreed to a dance duel, and defeated Kali by raising his left foot, to adorn his ear with a earring that had slipped away during the duel - a gesture that Kali failed to imitate and admited defeat. The Temple: A sprawling banyan tree constitutes the Stala Vriksham. There are inscriptions here which speak of grants given by Rajendra Cholan for the upkeep of the temple. Inscriptions here date all the way back to the 5th century. The towering Rajagopuram here, is visible for miles around. The towers and the walls surrounding the temple courtyards date back to the 12th and the 13th centuries. It is inferred from the inscriptions that an earlier Pallava temple was reconstructed and renovated during the Chola rule, and during the later Chola period beginning with the reign of Kulottunga Chola I, the temple campus was enlarged (1075 - 1120). One of the bronze images of Nataraja unearthed here, now adorns the Art Gallery of the Chennai Government museum. 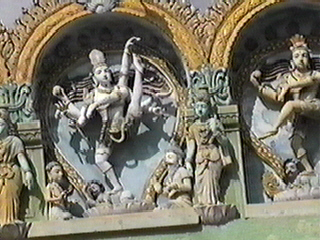 Stucco images depicting the five dance halls of Shiva (Chidambaram, Madurai, Tiruvalankadu, Tirunelveli and Kutralam) are seen crowning the entrance to the inner prakaram (see image above). Karaikkaal Ammaiyaar, one of the 63 revered Naayanmaars, was very closely associated with this shrine and her patikams form part of the 12 Tirumurais. Festivals: The Margazhi Tiruvadirai celebrations witness festivities related to the Cosmic Dance of Shiva.